Get your very own pair of TomTom Bluetooth headphones worth £50 for FREE in this current promotion. 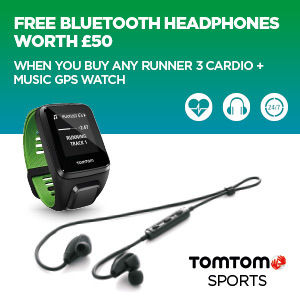 From 18th August – 30th September 2017 you’ll get free headphones when you purchase a TomTom Runner 3 Cardio Music watch, large or small size! See below how to claim your free Bluetooth headphones and click the button to see it in our store. Get The Small TomTom With FREE Headphones! Get The Large TomTom With FREE Headphones! 3. Complete the online registration form including a scan or photo of the original receipt and serial number within 28 days of purchase. 4. Receive your free Bluetooth headphones within 90 days of submitting a valid redemption request. You’ll find all the activity tracking features you would expect and more! GPS, Bluetooth to sync and update, 24/7 monitoring includes counting your steps, active minutes, calories burnt, sleep and more metrics, helping you get a better insight into your daily activities. What’s more, the multisport modes, the 5 different heart rate zones and the race mode give you loads of functionality for measuring your sporting and exercise performances. The difference between the small and the large version is the length of the strap. The small watch will suit wrist sizes of 125-172mm (4.9″-6.7″), the large watch 145-206mm (5.7”-8.1”). Get The Small TomTom Watch With FREE Headphones Here! Get The Large TomTom Watch With FREE Headphones Here!